Hosanna! The night is over, dear God, and the dawn of new light and life has come. How awed we are to hear the ancient story this day – that two thousand years ago the earth shook with a mighty earthquake, a stone was rolled away, the tomb that had held your Son was unsealed, and your love was let loose. The women who had come to Jesus’ tomb that morning left the site with that astonishing news. 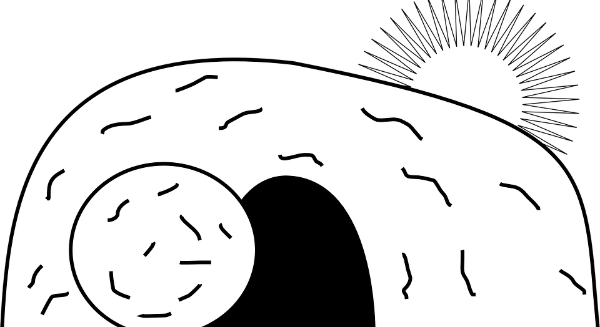 Though they had been told not to be afraid, they left that empty tomb, we are told, in fear, but also with joy. And we come this morning, acknowledging we harbor both emotions, as well. We harbor fear for everything broken in our world and in our lives that we cannot mend, for losses real and anticipated, for worries and struggles, for longings unfulfilled and doubts unresolved. But you teach us that our fears cannot entomb us or seal us off from your love, and so we know the joy of the visitors at the empty tomb so long ago. We feel that, too. We know the joy today of children’s smiles and candy-filled Easter baskets. We are surrounded with fragrant blooming flowers and awash in lush and jubilant song. We remember with fondness Easters past and with gratitude those people who have gone before us. Let all the joyful aspects of the day spill over us, God. For this morning, bright with spring sunlight, the wondrous good news we’ve gathered to hear reminds us that your Easter promise of new life extends beyond that cold tomb, extends beyond this day, extends beyond this lovely, fresh springtime season, extends, in fact, through every passing year of our lives, as time draws us all ever closer to you. And so, dear God, teach us, your faithful people, that we need not let ourselves be ensnared or entombed by doubt, or disappointment, or discouragement. For like Christ, our lives do not end in tragedy, but in surprising, joyous, eternal life! So send us out with that good news and let us run with it. Send us out to follow Jesus, the One who has gone before to show us the way to rise up past every discouragement and doubt – to rise filled with as much life as love will allow, and as much love as this life will allow – until, like the Christ we follow, we rise finally, into your very presence, a joyful people, with smiles on our lips and radiating Easter wonder. Hear our grateful, fearless prayer this bright Easter morning, that brims with your unconquerable love, as we join our voices in now song, praying the words that Jesus taught us … The Lord’s Prayer ….